DeWayne's Place is a 580 square foot home built in the 1930's C.C.C. Home built during the Roosevelt administration; built in Pondosa Oregon to house the workers that built Highway 86 which we now call the Hells Canyon Scenic By-Way. After the road was built the houses were torn down, brought into Baker City and resold as kit homes. Our recent renovations to the home included insulation never seen in the house before, new plumbing, heating, electrical, windows and doors and a completely remodeled interior. We are proud to say we used all local businesses to do this project and furnish the home, other than the bedroom set which is an original set from my husband’s mom and dad. This one bedroom, one bath home has custom tile work and a deep soaking tub, a kitchen/living area with granite counter tops, custom cabinets filled with everything you need to use our stainless steel appliances and a gas range and make a feast my dad would have wanted to enjoyed with you. Big screen TV and mission style reclining chairs in the living room will be a welcome place to relax at the end of a hard day of skiing, hiking, fishing our exploring historic places in the area. Situated within walking distance of Historic Baker City, Anthony Lakes Ski Resort is just 30 minutes from our front door and Hells Canyon and the Snake River are only an hour east of us. We won't nickle and dime you with cleaning fees and costly deposits, just the cleanest, most plush, up to date vacation rental in Baker County for an awesome price. Summer rental requests for less than one week are accepted within 60 days of the arrival date. Mike is owner operator for Baker County Pest Control and Debi runs the Baker County Chamber of Commerce and Visitors Bureau for our day jobs. We have made working on DeWayne's Place as our after hours career for the past year and a half. Summer rental requests for less than one week are accepted within 60 days of the arrival date. DeWayne's Place is named after my Dad, Duane. Dad had a nickname at our house; 'De-Wayne' is his name, fun and laughter is his game. Dad was living in Minnesota and diagnosed with CHF and Diabetes. When he was starting to need some extra help we bought the house next door for him to stay in while he was here visiting with us in Eastern Oregon. But, he never got to see it. It has been said that once you've met Duane, you were automatically friend and family. So my husband and I decided to continue working on the house and make it a place people could visit, after all Duane loved visitors. In this small town of Baker City, you have the unexpected opportunity to feel pampered in a house you would think you can only find in the big city. Custom Tile Bathroom with 24'' deep Soaking Tub, Double sinks and granite counter tops. 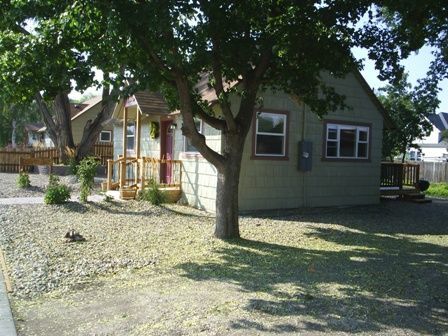 Private House is 6 blocks from Downtown Historic Baker City. This newly remodeled home uses state of the art insulation, new energy efficient windows and stainless appliances. The property has large mature shade trees, seldom needs any additional cooling system during our cool high desert nights. Comfortable Mission style furniture. This place was amazing! Clean and beautiful and just right for two! Loved all the little touches that made it that much more special and wonderful! It it fully equipped with everything you could want and or need. This is a great property with all the amenities you could ever need. It is cute, cozy and in a great location. Great hospitality. We loved our little cottage. Baker City is what you hope every small town is, friendly and helpful. This cottage kept it original charm but updated everything else. Great location, a wonderful park nearby, and Debbie was eved kind enough to call me when she discovered we had left some directions behind. The location is not only fantastic, but the house itself is immaculate. Comfortable bed, beautiful bathroom. Having a washer & dryer available was great as well. We enjoy being able to cook at least a few meals on vacation which was a breeze in the kitchen and the back deck was perfect for relaxing in the evening. Charming lovely cottage -Everything you could possibly need! Comfortable bed, great shower, fully equipped kitchen! Two leather reclining chairs after a long drive. Spotless!! Will stay again for sure! The location was superb- very walkable. Very well taken care of property, and Debi was very helpful and kind. My partner and I both found the bed to be too soft, causing back pain in each of us. If you have a bad back, this might not be the best fit. VRBO recently announced that they would be adding a service fee to all VRBO rentals that complete a registration through VRBO.com. VRBO assures their member businesses that this service fee of between 4-10% (the larger the rental payment the smaller the fee) will not deter customers from using VRBO to find vacation rentals. The service fee is assessed when you submit your payment on line. If this service fee would deter you from renting from DeWayne's Place, feel free to check the calendar for availability and then contact me directly to process your payment. Contact me at 541-403-0840 Deposits are returned within 7-10 days of departure. 20% discount for guests that arrive in a hybrid vehicle or on your pedal bike. All reservation requests that fall on national holidays or during local events are non-refundable rentals. Requests to extend your stay need 24 hour advance notice to the owner and payment in advance.